New guidelines for the management of blood cholesterol recommend treatment for lower LDL-cholesterol levels and support more aggressive therapies for adults with clinical cardiovascular disease (CVD). Announced in November by the American College of Cardiology/American Heart Association Task Force on Clinical Practice Guidelines, the recommendations offer an update from previous guidance released in 2013 and represent a move towards more individualized therapy. 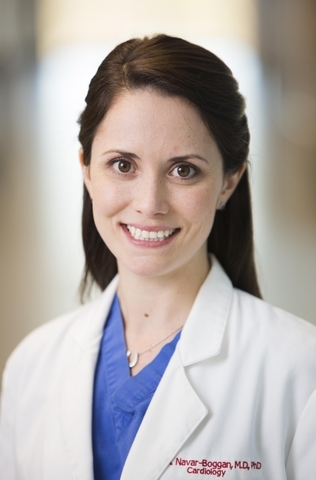 Ann Marie Navar, MD, PhD, a Duke cardiologist who specializes in treating atherosclerotic cardiovascular disease (ASCVD) and conducts research on ASCVD prevention at the Duke Clinical Research Institute. Navar says some of the biggest updates are in secondary prevention, or prevention of heart attacks and strokes in people who already have heart disease. “The guideline emphasizes the fact that in adults who have clinical CVD, particularly those who are at high risk for recurrent events, we should be adding ezetimibe and then a PCSK9 inhibitor if the LDL levels are over 70 mg/dL (1.8 mmol/L),” Navar says. Previously, guidelines emphasized high-intensity statins alone. “In our practices, we see many patients with CVD whose LDL levels are still 70 or above, even though they are using a statin,” Navar says. “A large number of patients are now eligible for add-on therapy.” Because of cost, the guidelines were less strong in their recommendation for PCSK9 inhibitors; Navar hopes that recent price drops will encourage more frequent use. The guidelines also incorporated a number of changes in primary prevention, or prevention of heart attack and stroke in adults who do not have clinical cardiovascular disease. One major update is the recommendation to use a coronary artery calcium score (CAC) to stratify patient risk. For those at intermediate risk, statins may not be recommended if the CAC score is zero, provided other risk factors are not present. “This is an important move, because it’s giving doctors and patients guidance on who we don’t need to treat, not just those who we do.” Navar praised the inclusion of heart disease risk factors not previously emphasized in guidelines. Those factors include such risk enhancers as inflammatory disease like rheumatoid arthritis, psoriasis, as well as HIV, family history, South Asian ethnicity, and a history of premature menopause or preeclampsia. The overall guidance, she says, will result in a more nuanced, patient-focused approach. Navar conducts research for and receives funding and consulting fees from Amgen, Regeneron and Sanofi. PCSK9 inhibitors are manufactured by Sanofi. This is an important move, because it’s giving doctors and patients guidance on who we don’t need to treat, not just those who we do. Ultimately, the therapy decision is up to the patient, but we want to have better, more informed conversations about these options with our patients. Emphasize a heart-healthy lifestyle across the life course for all individuals. Reduce low-density lipoprotein cholesterol (LDL-C) with high-intensity statin therapy or maximally tolerated statin therapy in patients with clinical ASCVD. Use LDL-C threshold of 70 mg/dL (1.8 mmol/L) to consider addition of nonstatins to stain therapy in patients with very high-risk ASCVD. Begin high-intensity statin therapy without calculating 10-year ASCVD risk for patients with severe primary hypercholesterolemia (LDL-C level 190 mg/dL [( 4.9 mmol/L]). Start moderate-intensity statin therapy without calculating 10-year ASCVD risk In patients 40 to 75 years of age with diabetes mellitus and LDL-C 70 mg/dL ( 1.8 mmol/L). Have a clinician-patient risk discussion before starting statin therapy In adults 40 to 75 years of age evaluated for primary ASCVD prevention. Start a moderate-intensity statin if a discussion of treatment options favors statin therapy in adults 40 to 75 years of age without diabetes mellitus and with LDL-C levels 70 mg/dL ( 1.8 mmol/L), at a 10-year ASCVD risk of 7.5 percent. Risk-enhancing factors favor initiation of statin therapy in adults 40 to 75 years of age without diabetes mellitus and 10-year risk of 7.5-to-19.9 percent (intermediate risk). See previous bullet. (See message 7). Consider measuring CAC in adults 40 to 75 years of age without diabetes mellitus and with LDL-C levels 70 mg/dL (1.8-4.9 mmol/L) who are at a 10-year ASCVD risk of 7.5- to- 19.9 percent and if a decision about statin therapy is uncertain. Assess adherence and percentage response to LDL-C-lowering medication and lifestyle changes with repeat lipid measurement 4 to 12 weeks after statin initiation or dose adjustment, repeated every 3 to 12 months as needed.